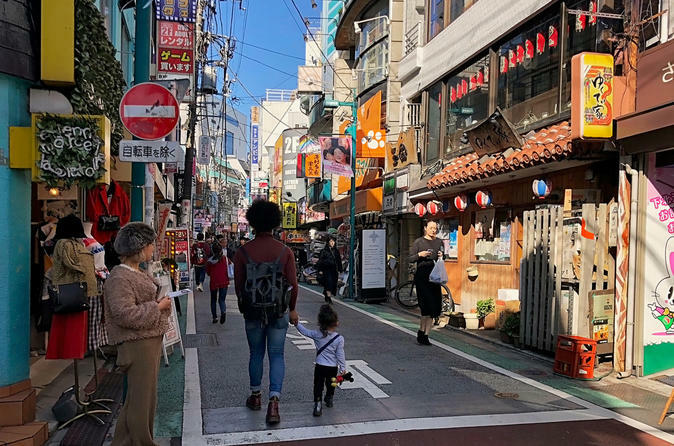 Explore this Tokyo neighbourhood, affectionately called “Shimokita” by the locals, on a personalised experience with a Local Host! This creative district was once a humble farming village, but is now known for its liberal bohemian spirit, vintage shops, coffee and live music venues, so immerse yourself in this artistic district with your Local Host! Enjoy sifting through vintage and vinyl stores and soaking up the quirky atmosphere, grab some cheap local eats in a soba shop or izakaya, sip Antipodean coffee and discover the buzzing music scene. The experience is totally personalised to your wants, needs and wishes, so you can explore this creative district exactly how you want to, with a knowledgeable Local Host by your side! Join a like-minded Local Host and discover Tokyo's Shimokitazawa neighbourhood. This artistic enclave is only a few minutes train ride away from Shinjuku and Shibuya stations, but it feels a world away from their bright lights and billboards. From its beginnings as a small farming village, the neighbourhood has evolved into one of Tokyo’s most bohemian and creative districts, which today is known for its thriving arts culture and a music scene which is renowned all over Japan as the country’s best. You could stroll along the narrow streets which are barely big enough to let a car squeeze through and spot the incredible wall murals and street art on every available wall in the area! Along its tiny alleyways are a number of vintage, thrift and vinyl stores too - and your Local Host will know the best ones to visit. When it comes to food you’re spoiled for choice - let your Local Host introduce you to the enjoy cheap eats at tiny neighbourhood ramen, soba or sushi joints. Or, refuel with a coffee from one of the trendy Antipodean style coffee shops which are popping up in the area. Perhaps instead you'll want to check out a foodie pop up, Shimokitazawa Cage, a community space where you’ll find a revolving cluster of food trucks - the choice is yours! Shimokitazawa is probably most famous for its live music scene. With your Local Host, you can head to a bar where you can catch some live music or let your host give you the rundown on the neighbourhood’s music scene and recommend the best bars and venues to come back to once night has fallen!